Replacement Pyrex Lids - There is such a thing! Keep Your Glass Bowls. Replacement Pyrex Lids – There is such a thing! It was one of those times where the world's aligned and everything came out just perfect – the right amount of salt, seasonings, consistency – it all was perfect. I was so looking forward to leftovers. After dinner, we cleaned off the table and I put the leftover soup in one of those glass Pyrex bowls with lids. You would think that would have been the end of it. Dinner done. Kitchen cleaned. Lights off. But I had three things working against me last night. Why the soup stayed out. First, one of our sons was out late – so I left the soup on the counter thinking that he might have some when he got home. Second, I had just done a huge amount of food shopping, so the fridge was filled to the brim. Third, those darned glass Pyrex bowls – well, most of my lids (they are made of plastic) have become brittle and broken over the years. So, I don't have a lid for every container. My son wasn't hungry when he got home so he didn't eat any soup. This morning I discovered a little free space in the fridge. And, of course, the soup sat forgotten on the counter all night. I had to throw it out. When in doubt …. I know that ultimately, I should have been the one to put dinner away. If I actually had a lid to put on that Pyrex bowl, I would have put the soup away. Plain and simple. I have been meaning to get a new set – but the old glass bowls are just fine. It's the lids that are the problem. So, this morning, I was on a mission to find a solution. I thought about going to the thrift shop to look for replacement Pyrex lids but figured I should start with Google first. Lo and behold – the Pyrex site does sell replacement lids. But they are expensive for what they are and you have to pay shipping. I was just going to bite the bullet and order a whole new set from Amazon – because the cost would have been about the same. If Amazon sells Pyrex sets – they probably sell replacement Pyrex lids too. And with my Amazon Prime membership (they offer a 30 day free trial), two day shipping would be free. I found that Amazon does in fact sell replacement lids for Pyrex glass containers in many sizes. I do have one small issue with the process, however. The lids are based on cup size of the container. But on the bottom of my larger container, the volume is stated in quarts and liters (in hard to see raised glass wording – perfect for the young but not the older-ish). And my conversion skills are a little rusty. Luckily, again Google to the rescue. You can just type in how many cups are in so many quarts and you get your answer. I suppose if you have an Apple Watch or an iPhone, you could also ask Siri and if you have an Amazon Echo then your assistant would be Alexa – I'm sure one of them would have the answer. Do you need replacement Pyrex lids, or is it just me? 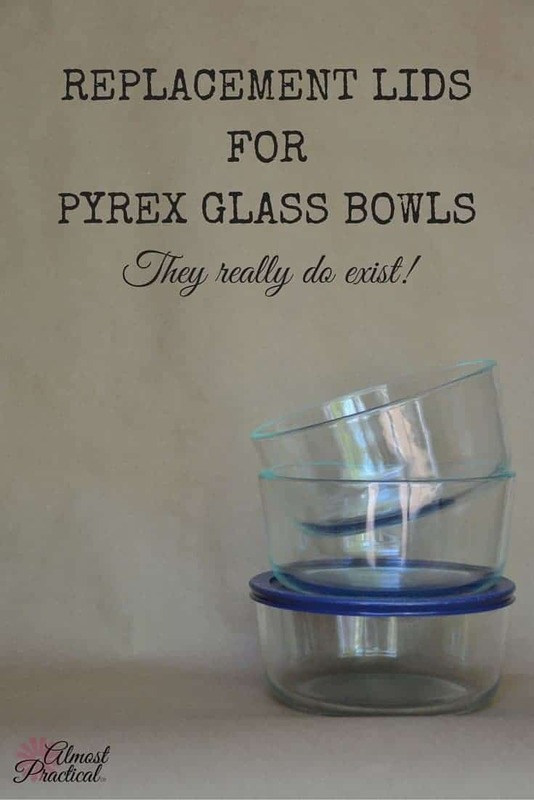 Have you been confounded by your Pyrex glass bowls? Tell us your story in the comments below. Wondering how to organize your Pyrex lids? All of my glass food storage containers were a big mess until I started using this little tip. « How Do You Make Money With A Blog? I’ve suffered through the same issue. And when I tried to put plastic wrap on top of the bowl, it just never sticks. It’s fantastic that you have found the solution. Who knew that there is hope at the end of the tunnel. Amazon does it again! I know how the tops can crack or get bent, or even lost (in my house) so it is great that you brought this to our attention that we can get those covers! I don’t like to put anything in plastic. For me..it has to be glass all the way. I purchased Pyrex bowls and the plastic lids cracked after only 3 uses. I am really disappointed and with the replacement lids being so expensive I do not plan on purchasing any more. I now look for the snap lock lids and hope that they last longer. That is disappointing. I had better luck with my Pyrex lids – they did last much longer, do I didn’t mind getting the replacements. However, I recently ordered a set of these silicone pot lids (Amazon) which are pretty unique. They cover your bowl or pot and with a slight press they form a suction. I use these in place of plastic wrap when I put a bowl that doesn’t have a lid in the fridge. They certainly are not airtight and would not prevent spills but they are a versatile option – especially for glass Pyrex bowls that no longer have lids. And as a bonus, they are heat resistant too. I hope the snap lock lids last longer for you. 🙂 I have not tried those yet. I really do not know, unfortunately. Amazon is my go to, not sure if it is available there. I’m sorry, but I think that lids for these pyrex containers should last longer. I only had my bowls for a short period of time and the lids did cracked. I paid good money for the sets and would like to be able to use both when I need too. Pyrex should come up with a different product to manufacture the lids or sell the sets with extra lids included. Agreed! I love the idea of including extra lids. It would be great if the Pyrex lids lasted longer. That is a tough question. I did a quick search on Amazon and could not find any. Maybe you could reach out to customer service at Corning or Pyrex and see what they say. Good luck with it! You know what I would LOVE to see? Silicone pyrex lids. They’d be less dangerous with the inevitable leeching of those awful hormone disrupting plastics chemicals (as they’re cleaned and microwaved over the years), easier to clean and longer lasting. That is a great idea! You would think they would have already come out with these. Pyrex – are you listening? And they should! I have a ziploc brand storage bowl (2 cup size) that came with a silicone lid that I got for cheap at my grocery store. It was the first glass bowl that I got for leftovers and storage. That lid has outlasted two sets of the plastic lids that Pyrex supplies with their bowls, which were purchased some time after the Ziploc giveaway! Why don’t they make something more durable than these plastic lids?? They say they are ok in the dishwasher, but I now wash them by hand hoping they’ll last longer. Come on Pyrex, get with it!! I think the idea of using silicone for the lids is genius. That probably would solve everything. Fingers crossed! They do make silicone lids for Pyrex containers in the Pyrex Ultimate line (actually a glass lid with a silicone edge/gasket)–and, as I understand it (see comments in links below), they will fit on “old” (non-ultimate) storage containers. See https://www.pyrexhome.com/product/ultimate-4-cup-round-glass-storage-lid-white and https://www.pyrexhome.com/product/ultimate-7-cup-round-glass-storage-lid-white and https://www.pyrexhome.com/product/ultimate-3-cup-rectangle-glass-storage-lid-white and https://www.pyrexhome.com/product/ultimate-6-cup-rectangle-glass-storage-lid-white . I haven’t used them, and am not recommending them, but wanted to mention that they exist. Thank you for telling me about these – I had no idea! After reading your reply I took a look on Amazon and found these Pyrex silicone lids here. The important thing, I think, is to check the model numbers on the bottom of your Pyrex glass dishes and make sure the lid is compatible (it’s in the product description) before you order. Shame on PYREX. I have had two Visions Heat and Eat bowls with lids for over twenty years. I use them regularly and the lids are still PERFECT after all these years and uses. I have a couple fairly new (2-3 years) Pyrex sets and all of the lids are brittle and cracked. There is no reason other than planned obsolescence, that they can’t make lasting quality. All in, I spent $16 on six replacement 3 cup (rectangular) lids. I didn’t quite need six yet, but figured they’d all eventually get used. I did notice that they didn’t fit as tightly as the originals, so unsure if these are quite as good an air/water-tight seal and for about the same money I could have gotten three brand new 3 cup tops with the glass dishes. Maybe I just don’t understand the costs involved for producing and shipping each piece, but I feel like the lids should be far less than 50% of the total cost. I know the feeling – it is almost more economical to get a whole new set of Pyrex. But it just doesn’t feel right getting rid of (or donating) the old glass bowls which are in perfect condition. It seems like the replacement Pyrex lids should cost a bit less than they do – or maybe they should just include a few extra when you buy a whole set. Just contacted snap ware and said that I had ( 4 ) lids for glass containers that the latches had broken. the customer rep. said they have a warranty and are sending me new snapware lids, it will take 7 to 10 days for delivery. We use these containers all the time and have been very good. That’s fantastic and good to know – thanks for sharing with us! Neena, I’m a little frustrated with the cracked lids on my Pyrex mixing bowls set. I’ve had them for just a few years, used them carefully, always hand-washed them, haven’t used them all that much, and another just cracked a few minutes ago! On the other hand, I know a woman with a drawerful of Tupperware that is 30 to 40 years old, heavily used, and the lids are in perfect condition. I would not want to store my food in plastic bowls, but I don’t mind a plastic lid, IF it would last!